I decided to take few days off and to escape the everyday routine. I call such little escapes ‚Time out‘. 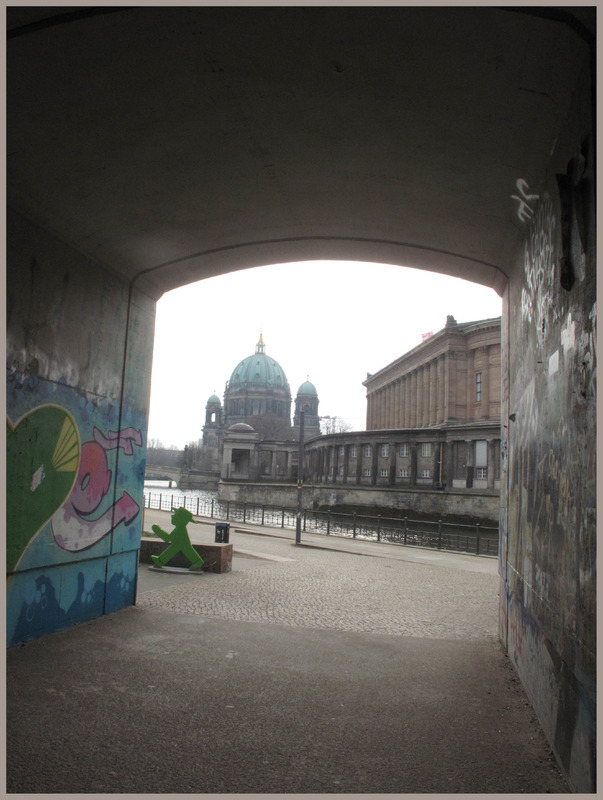 This time I chose Berlin as my destination, partly on purpose, partly it was a spontaneous decision. There were many possibilities where to fly, where to go but finally Berlin attracted me for some reason. Of course one of the reasons was my intention to immerse myself into the fluency of german language as well as to remember old places which I liked when I was living there 20 years ago. I had been there few times in between but I felt it was time to visit this city again. Why? I did not know but I knew there was a hidden reason. I love the train journey from Prague up to Berlin when the train passes through České Středohoří and follows the riverbank. I love all the valleys and hills and rocks and the river reflections in the train windows. You can just be sitting in the train and observe the beautiful landscape stretching from Prague up to Dresden and fell silent into your own thoughts, plans, wishes, ideas or dreams. The train journey takes only 4,5 hours. It is not long but at the same time it gives you enough time to relax and to be on your own listening to the quiet rythm of the train and the whispering voice of your mind. It has a real magic. I opened a magazíne I had bought in the railwaystation. First picture that caught my attention was a photo which won the ‚World Press Photo‘ this year. There was a big ship in this picture carrying about hundred of immigrants sailing from Africa to Italy. I could not say why I had been struck by the picture so much. I was looking at all the faces one by one and observing their face expressions reaching from excitement up to a question mirroring in their eyes: Here we are, closer to our dream, new land, new future, but now, what? What is going to happen? Then I started to browse through the magazíne pages again and forgot for a while about the impression the photo had made upon me. It came back to me two days later. I was with a friend at the exhibition at Check Point Charly in Berlin. Exhibition was showing pictures from the times when the Berlin Wall had still been dividing the city into two parts. There were many names written on the lists on the wall, names of those who had tried to cross the border risking their lives, perhaps being pressed by a strong desire to leave the eastern part and to enter a new world promissing more freedom. The line was carefully guarded at those times and those who made the attempt to cross the border did not have much chance to succeed and were shot. A picture with the african immigrants came to my mind again. There doesn´t seem to be any connection but I suddenly saw the connecting link – this desire for a change, for freedom, this longing for new prospects and a new life. This desire must have been so strong that it brought people into action risking their lives. I think that we all perceive sometimes such desires to escape, to change something, to find a new world or new sence of life or a direction in life. It actually doesn´t need to be that dramatic, crossing the sea in order to find a new life path, it doesn´t necessarily mean crossing the Berlin Wall … it may only be an inner border in ourselves which we sometimes want to cross, a border which separates us from one phase of life and a new one. The picture in the magazíne, the photos at the exhibition just showed me in a big picture what is sometimes happening in a small world of individuals. Our eyes are gazing to the horizon where we think there may be shining new prospects. Some of us just keep dreaming and give up the distant dream out of fear to lose their security. Some of us make an attempt and then withdraw back, some of us continue following the inner voice and risking losing the familiar security of the world in which they are living. When you manage to get to the horizon, to the opposite riverbank, you may be surprised. Everything is so different, landscape, surroundings, people … so different in comparison to what you have dreamt about … you still have the roots on the other side, it was your home, it was the place you came from, where you grew up and absorbed the culture into every cell of the body and mind. But it still conceals a challenge, a mysticism, a magic. You are facing a new world, you are meeting with a new culture, you have to learn new things connected with the new phase of life. You have to learn to adjust and to learn from what you see and what is different from what you knew and learnt in the past. That is a big challenge to find a new way in a clash of two different cultures. It is everyday story of the life. Many of us long for a change which is sometimes difficult to define. It is just an inner feeling, a need. Still, life is changing in every moment. Even if we resist the changes we still are moving and changing. Lots of people wish for a change. Imagine you are an individual, a unique person longing for love, for a relationship. May be you have to change something within you so that it comes off and then you meet Him/ Her … you are standing there on the horizon happy to get there but suddenly you start to see that things are bit different than you imagined them to be. You stepped over to a next phase of life. And if you cannot welcome and accept the differentness of your partner then there is a struggle. And this is a similar challenge to find a new way in a clash of two different individuals. Thank you to Joao who showed me the magic of the night view of Berlin from the roofs of the beautiful houses in Berlin Kreuzberg.